Oats is a healthy way to kick start one’s day and I try to include it in our diet at least 3-4 times a week. I have noticed that hardly any Indian recipes with oats have made it to the blog even though oats are an integral part of our morning breakfast routine. A couple of blog readers have been requesting for recipes using oats and I thought it would be a good idea to do a series of Indian oats recipes on similar lines to Chaat recipes that I did two years ago. The highly nutritious, wholesome, high fiber, nutty and filling oatmeal is a regular breakfast fare for Nehal, either in the form of a savory vegetable broth or a fruit/yogurt porridge, which usually takes less than 10 minutes to prepare. Satish and I prefer our Indian-ized oatmeal avatars – upma, rava dosa, instant rava idli, ponganalu, pongal, uttappam, roti, bisi bele bath and the likes. Using oats in Indian style recipes can be quite tricky as it tends to have a sticky texture, so its a good idea to dry roast the oats for a few minutes before using it. I usually dry roast a packet of oats and store it especially for Indian style recipes with oats. 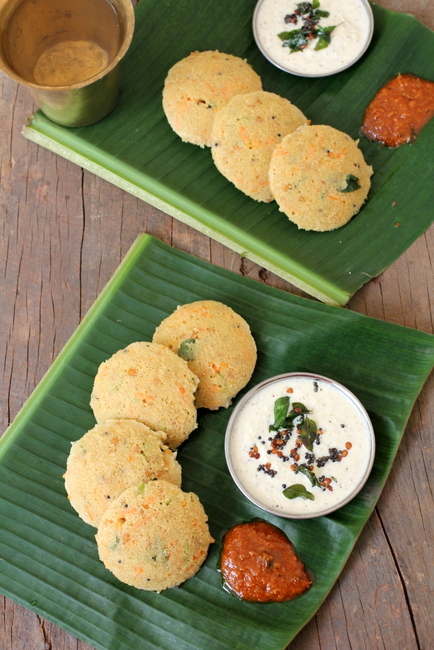 I’m kick starting the series with a favorite breakfast of mine, Instant Oats Idli recipe. Heat oil in a heavy bottomed vessel. Add mustard seeds and as they begin to splutter, add urad dal and let the dal turn red. Add chopped green chilies, curry leaves and asafoetida and saute for a few seconds. Add grated carrot and saute for 2 mts. Add semolina/sooji and saute for 4 mts. Add coriander leaves and turn off heat. Cool. Add the ground roasted oats powder and salt to taste. Add the curd and mix. Add just enough water to make a thick dosa batter. Grease idli plates or a stainless steel cup. Add eno salt or cooking soda and mix well. Pour a ladle full of batter in each greased depression of the idli plates. Steam for 13-15 minutes. Serve warm with chutney of your choice. You can add vegetables of your choice - capsicum, cabbage, peas etc. Addition of toasted cashew nuts gives a richer taste. Addition of Eno Salt or Cooking soda yields fluffy idlis. Buttermilk can be substituted for water while preparing batter. By Sailu Published: August 22, 2012 Instant Oats Idli is a healthy Indian breakfast recipe with oats, rava, carrot, yogurt and spices. Nutritious and tasty recipe using oats. Just when I was thinking about lunch and saw this superb post. I just now made this for my toddler’s lunch and he loved it). Thanks a ton!!! Looking forward to many more such recipes!!! I had a lot of oats sitting in my pantry. I’m not a fan of Oat meal. Your instant Oats idli came out really good.Fantastic recepie . Very healthy and filling. Thanks for sharing this recepie. Healthy and definitely a super filling breakfast..
Hope you post both of them. Envy you the banana leaves. Sailu, I LOVE this recipe. Almost makes me want to buy an idli steamer. But I think I’ll just make them in a baking dish and cut them up. Thoughts? My kids absorb idlis through their skin!! waw…what a presentations Sailu garu!! Very nice..the banana leaf gave it completely Andhra look!! soo yummy…can’t wait to try it out!! Sailu, thank you for posting such healthy breakfast options. I can’t wait to try this recipe. What variety of oats did you use? Also could you a suggest any particular brand name that is available in India. I use Quakers quick cooking oats. Hi sailu garu, i often surf your receipes and also make them. They turn out awesome. My husband just appreciates them. thank you for all wonderful receipes. All your oats recipes are very good.Thank you for suggesting these healthy breakfasts-easy to make too. I tried the oats Idli receipe.Thanks for suggesting such good healthy foods.But my idlis didnot turn out the way as in the pictures. They are a bit greasy but the taste was awesome. 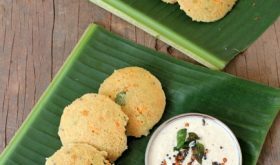 Can you help me how to get rid of greasiness in the idlis? sailu, i love your recipes.What type of oats you use for recipes, whole oats or steamed oats or instant? Thanks Sailu. I followed your instructions and the idlis came out really well except they didn’t become fluffy (didn’t rais) like normal ones. What do u think I might be missing? The baking soda should be fresh. Or use Eno salt just before pouring the batter into the idli molds. Sailu: Thank you for your recipes! I will be making quite a few of them. I have a question. A friend of mine would love this idlis, but she can’t have dairy. What should I use instead of curds? Thank you! You can try adding some coconut milk or soy milk. I have never tried it though. I tried this recipe yesterday. I cant eat oats with milk as I am lactose intolerant and I usually used to make oats poha but I loved this variation. I did the tempering with some tomatoes, onions and peanut chutney. Hi Sailu, this was awesome and came out well. I have question here. We liked it, but my FIL is a high-cholesterol patient, who need to avoid suji, maida etc. Can I substitute suji with fine wheat rawa? Yes, you can use bansi rawa/coarsely crushed wheat. This was awesome receipes, I added sweet corn kennels and I steam cooked and also microwaved some but thet were a little rubbery so prefer the normal steam cooked.thank you. I would be interested on your ondhwa receipe please. I don’t have eno with me, is it ok to use baking soda instead? Yes, you can use baking soda. 1/4 tsp should do. Hi – great recipe but makes infinitely more than 4 ! Thanks. Great recipe. Any suggestions as to what i can use instead of semolina? I am gluten allergic. Don’t prefer to use rice either. 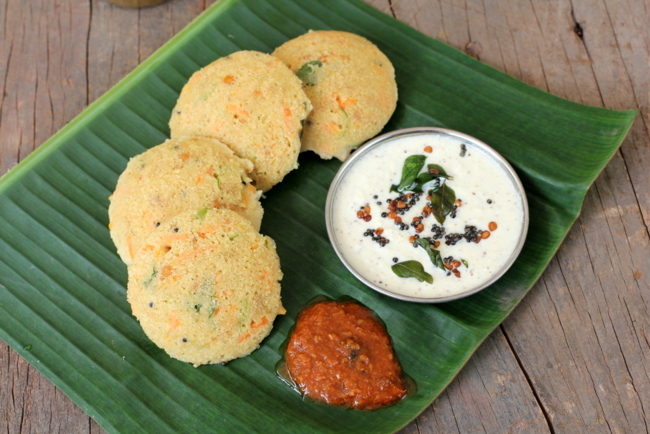 Its our go to instant idli recipe. We love it and it comes out moist and fluffy every time. That being said I must have made it a dozen time already. Better tasting than soji only instant idli. I just mix eno as I go. That means add just enough for the batch and not all at once. Trick to fluffy idli each time. Keep up the good work. My wife tried this out today and it has come out awesome….. Just that with soda it has not come out very fluffy.. But taste is awesome and no one can eat just one…. ??? ?